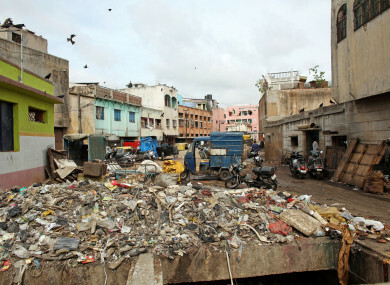 A street full of trash is pictured in Bangalore, India, in 2012. POLLUTION WAS LINKED to 9 million death worldwide in 2015, the equivalent of one in six deaths that year, new research shows. It found that air pollution was the biggest contributor to deaths, being linked to 6.5 million deaths in 2015. Water pollution was second, being linked to 1.8 million deaths, while workplace pollution was linked with 800,000 deaths. The study in found that almost all air pollution-related deaths (92%) occurred in low- and middle-income countries. In rapidly industrialising countries like India, Pakistan, China Bangladesh Madagascar and Kenya death due to pollution can account for up to one in four deaths. The report from the The Lancet Commission on Pollution and Health also found the welfare losses due to pollution are estimated to cost more than $4.6 trillion (€3.9 trillion) a year – equivalent to 6.2% of global economic output. Country data shows that 1,774 for death in Ireland were linked with pollution in 2015. This represented just over 6% off deaths that year and is significantly below the world average. The greatest number of pollution deaths occurred in India (2.5 million deaths) and China (1.8 million). The Lancet Commission on Pollution and Health is a two-year project that involves over 40 international health and environmental authors. It uses data from the Global Burden of Disease study. Email “Pollution linked to nine million deaths around the world in 2015 (and close to 1,800 of those were in Ireland)”. Feedback on “Pollution linked to nine million deaths around the world in 2015 (and close to 1,800 of those were in Ireland)”.